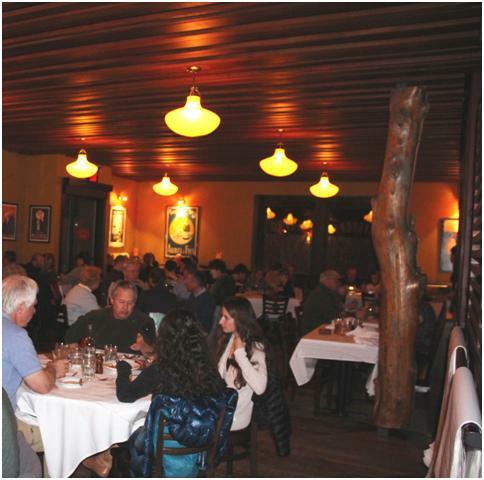 Restaurant Review: Jackson Hole’s Rendezvous Bistro - Ski. Play. 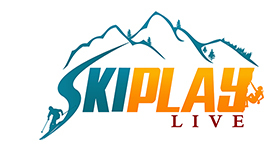 Live. It’s easy to cruise into Jackson, Wyo., and immediately blow your budget on your first night in town. There are nearly 100 dining spots in the area and a gazillion bars serving inventive, non-Utah-pour, cocktails. It’s hard to choose. But one place stands out as a local’s go-to when you’re looking for something with adventurous, daring and farm fresh menu items in a casual, family friendly atmosphere. You gotta do what the locals do and meet at the Rendezvous Bistro. The spot on the main drag as you come into town was once a Denny’s but a couple of friends rooted in the back kitchens of other local restaurants decided to open their own and turn it into more than a pancake house. Eventually, the Bistro became the flagship for an eclectic portfolio in Jackson run by the Fine Dining Group. Gavin Fine and Roger Freedman started the French-American Bistro to introduce this cowboy town to a fine dining experience that was also fun, lively and not quite as expensive as many of the other guys. The menu is rife with crazy combinations like lobster pot pie, beef scallopini with poached egg, spicy Thai monkfish, and a $12 grilled cheese sandwich with bacon and avocado. They also have one of the only raw seafood bars. 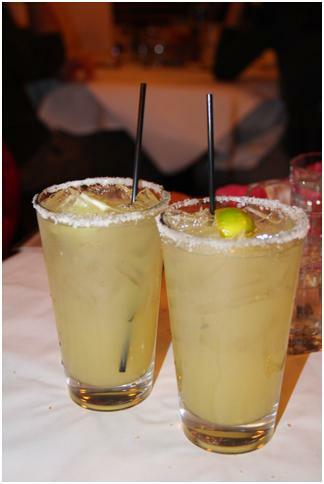 But I preferred the traditional bar with the spicy margaritas. Some of the dishes might not appeal to picky palates. 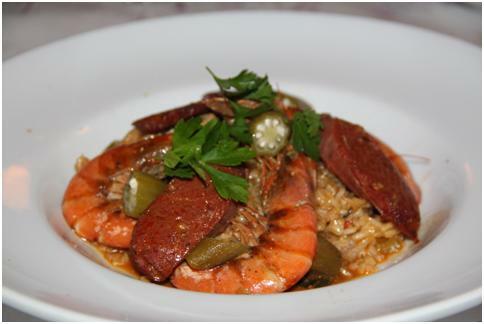 The jambalaya with venison chaurise was infused with pickled okra which drastically alters your traditional jambalaya experience. 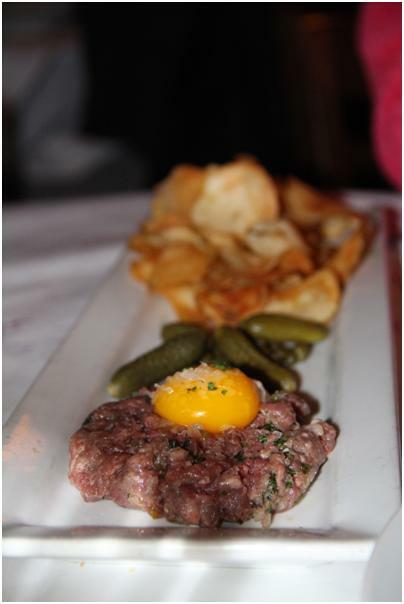 The carpaccio was not your usual thin slices of raw beef but more like a raw mini slider patty topped with a raw egg. If you don’t mind the texture, the combination (you scoop it up with housemade potato chips and a couple of capers) was delicious. 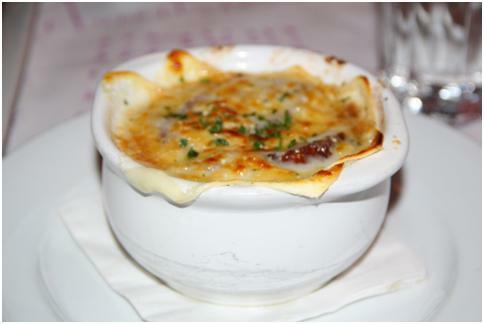 The French onion soup was perfect and exactly as you would expect a drool-worthy pot to appear. 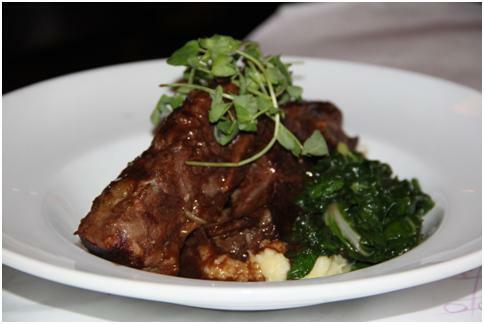 My guest couldn’t stop swooning over the delicate melt-in-your-mouth braised short ribs special. All the desserts are made out of the Q Roadhouse (another FDG operation) but the commute won’t affect their deliciousness. 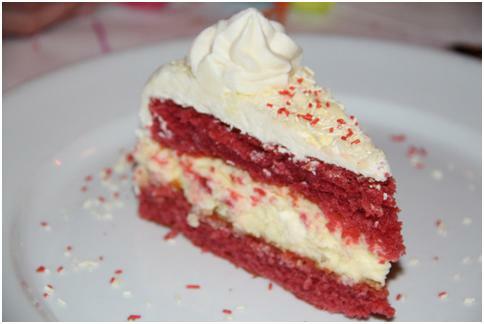 We inhaled every crumb of the red velvet cheesecake. From drinks to dessert, you can make an entire evening out of just one stop. 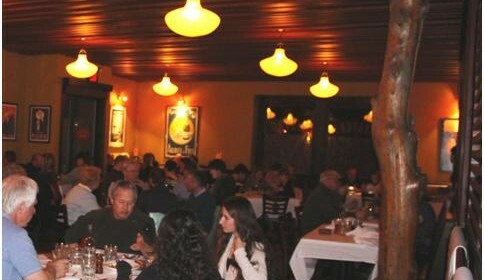 The Rendezvous Bistro is a true taste of Jackson Hole.